We recently announced the general availability of Geospatial Functions in Azure Stream Analytics to enable real-time analytics on streaming geospatial data. This will make it possible to realize scenarios such as fleet monitoring, asset tracking, geofencing, phone tracking across cell sites, connected manufacturing, ridesharing solutions, etc. with production grade quality with a few lines of code. The connected car landscape and the turning of the automobile into a real-time data exhaust opens new avenues of business for automation, and post-sale monetization opportunities in industries such as insurance and content providers. NASCAR has been a pioneer in using geospatial capabilities in Azure Stream Analytics. “We use real-time geospatial analytics with Azure Stream Analytics for analyzing race telemetry during and after the race,” said NASCAR’s Managing Director of Technology Development, Betsy Grider. The new capabilities provide native functions that can be used in Azure Stream Analytics to compute geospatial operations such as the identification of geospatial data as points, lines, and polygons, computation of overlap between polygons, intersections between paths, etc. The ability to join multiple streams with geospatial data can be used to answer complex questions on streaming data. CreatePoint - Identifies a GeoJSON point. CreateLineString - Identifies a GeoJSON line string. CreatePolygon - Identifies a GeoJSON polygon. ST_DISTANCE - Determines the distance between two points in meters. ST_OVERLAPS – Determines if one polygon overlaps with another. ST_INTERSECTS – Determines if two line strings intersect. ST_WITHIN – Determines if one polygon is contained inside another. The integration with Power BI enables live visualizations of geospatial data on maps in real-time dashboards. 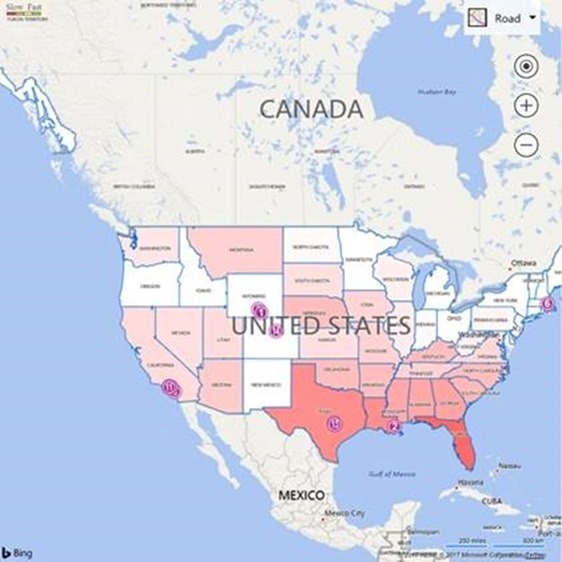 It is also possible to use Geospatial functions for actualizing scenarios such as identifying and auctioning on hotspots and groupings and visualize data using heat maps on a Bing Maps canvas. Live heat maps using machine learning and geospatial analytics can help unlock better business outcomes for ride-sharing and fleet management scenarios. This video shows a fleet monitoring example built using the functionality detailed above. The GeoSpatial Functions documentation page covers detailed documentation and usage examples. 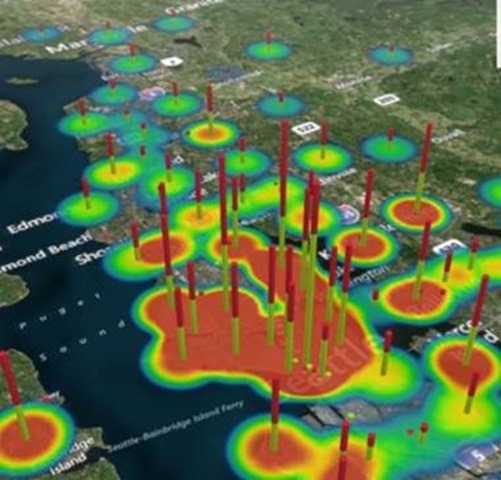 We are excited for you try out geospatial functions using Azure Stream Analytics.